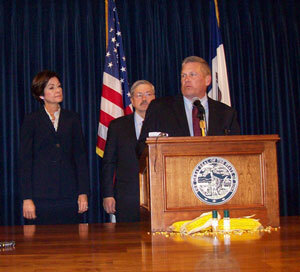 Ag Secretary Bill Northey with Governor Branstad and Lt. Governor Reynolds. The State of Iowa will use a $250,000 federal grant to bolster a program that pays gas stations to install “blender” pumps that incorporate a higher percentage of corn-based ethanol in motor fuels. Most Iowa stations offer a 10 percent ethanol blend. Governor Terry Branstad says the goal is to boost usage of a 30 percent blend. “It’s my understanding that 30 percent is kind of the ‘sweet spot’ in terms of the best fuel efficiency with an ethanol blend,” Branstad says. Iowa Ag Secretary Bill Northey says the expanded sale of E-30 will help Iowa maintain its leadership position in the ethanol industry. “Not only on the production side, but on the consumption side,” Northey says. There are 41 ethanol plants in Iowa and 25 percent of the ethanol produced in the U.S. comes from Iowa. About 17 percent of the country’s biodiesel comes from the dozen biodiesel plants here.